DUMBARTON moved off the bottom of the Irn-Bru Scottish League first division for the first time since being promoted with a fine 3-1 win over Hamilton Accies. DUMBARTON moved off the bottom of the Irn-Bru Scottish League first division for the first time since being promoted with a fine 3-1 win over Hamilton Accies at the Bet Butler Stadium. An excellent fighting performance warmed up a very chilly afternoon for the 900 crowd, and new manager Ian Murray's men made it five wins out of six to move three points clear of Cowdenbeath and Airdrie United with games in hand over both. Sons had the better of the first half, and it was no surprise when they opened the scoring with a fine header by midfielder Chris Turner, and that is how it stayed until half-time. Billy Reid's Accies showed more purpose in the second half, testing keeper Jamie Ewings on several occasions. But the goal came at the other end when Mark Gilhaney netted. It looked all over, but then Ewings blundered with a clearance kick which fell at the feet of striker Stevie May, and he shot home to narrow the gap. Soon after Ewings rushed from his goal and appeared to foul an attacker, but the linesman ruled that it happened outside the box. The tension was eased a few minutes before full time when a Gilhaney cross was met by Bryan Prunty, and his effort went into the net off a defender to wrap up the points. 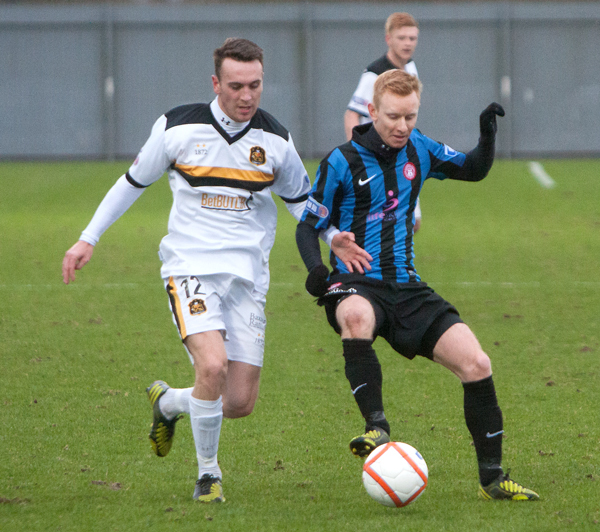 The image is of winger Mark Lamont — making his debut as a signed Sons player after two loan spells from St Mirren — battling with an Accies defender.